Whisper Aire's 1000 Compressor offers the airbrush artist a fully featured, low-noise compressor that’s portable and compact. Its oil-less operation means no maintenance. This compressor is a pleasure to use, with a sound level that’s barely above a whisper. The automatic shutoff switch permits the compressor to turn itself off when not in use and back on when the user resumes airbrushing. This eliminates heat-related moisture build-up, reduces running time, and minimizes motor wear. 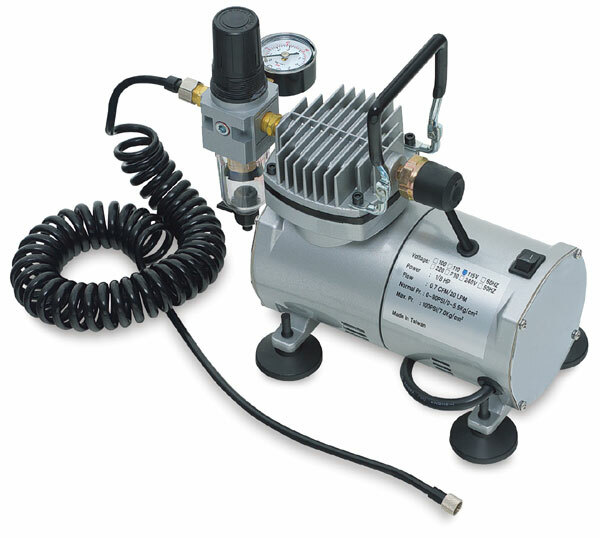 The single-piston, 1/5 HP motor is capable of delivering up to 38/40 PSI of pressure with a flow rate of 0.80 CFM. It features a moisture trap with filter, air regulator and gauge, and a 6 ft coiled air hose. ™ Whisper Aire is a trademark. WhisperAire is a trademark.